One of the tenets of the Web 2.0 world is user-generated content, the idea that anyone can use a few easy internet tools to publish their works – a blog, an article, a video, a picture, whatever you want. With Web 2.0 there are fewer editors, fewer barriers. That obviously brings with it pros and cons. On the one hand it gives voices to hundreds of thousands of people who might otherwise not have been able to get past the gatekeepers. There’s an opportunity for anyone to find an audience. On the other hand, well, it gives voices to hundreds of thousands of people who might otherwise have not been able to get past the gatekeepers. Everyone is able to judge for themselves what is worth paying attention to and what isn’t, but sometimes the gatekeepers (the editors, the A&R people, the talent scouts) functioned as as a useful filter. Web 2.0 often lacks that – for better and for worse. The challenge in the new media world is finding what you want; separating the metaphorical wheat from the chafe, finding the diamonds and throwing back the coal. In journalism, outside of blogs and those equipped to build and host their own websites, one of the Web 2.0 companies embracing user generated content for news has been NowPublic. Now, thanks to a new financing, they’ll soon become more widely known. NowPublic’s been at the forefront of push some have labeled “Citizen Journalism.” In simplicity, their service is a website on which anyone can post articles and pictures of news happening around them. With the proliferation of cell phone cameras and Internet access it’s something of a novel idea. When news breaks, professional press isn’t always there to record it, but everyday folks likely are. A recent report from Forrester research estimated about thirty-seven percent of eighteen to twenty-one year olds, and thirty percent of twenty two to twenty six year olds are people who publish web pages, write blogs or upload content to sites like YouTube. Another 35%, on average, participate as regular commentators. 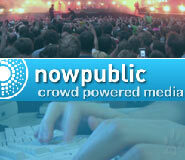 NowPublic hopes to be outlet for their news stories and for their voices. Author’s aren’t paid but they’re given a platform . In the NowPublic’s marketing lingo, news becomes “crowd sourced.” Snap a shot of something newsworthy on your phone? Happen to have something you think should be in the press – you can write it and post it. If you had been in New Orleans during Hurricane Katrina, for example, you could have helped tell the city’s story. And if your news offering is good enough, it might even end up syndicated (but don’t expect payment from that syndication. That’s generally not part of the deal). Based in Vancouver, NowPublic says it has 118k contributing journalists and global reach through more than 140 countries. In June 2006 they raised about a million dollar with a goal, essentially, to be the world’s largest freelance wire service. To achieve that goal, they’ve tried to create a website that acts as a portal and entry. In many ways, it’s a news oriented “social network.” They call it “crowd powered media.” In the time since last funding, they’ve built up their platform and signed syndication deals to make it happen. Through partnerships, including with the Associated Press, NowPublic is positioned to distribute select articles, photos or videos for publication elsewhere on the wire service network. While NowPublic doesn’t do much to filer the volume of information out there, and it would be nice if they (or someone) did more, but they are making headway at adding to the volume – some pieces more worthy than others. Today, they’ve announced a substantial private financing to help them expand. Led by Rho Ventures and Rho Canada, with additional funding from previous investors Brightspark and GrowthWorks Capital, the company raised $10.6m. The war chest will be used for continuing operations, including likely building out the site to add more social media related features (presumably like news aggregator Digg or personal news portal Newsvine). Expanding the social functions of the site, theoretically, will attract users and give reason for them to keep interacting and contributing to the site (which is essential for the company’s growth and survival). In doing so, they’ll begin to compete with slightly different Social News sites like Newsvine but the money should, at the least, help them further distinguish themselves from competitors like AssociatedContent and OhmyNews. As is the norm in private financings, specific terms or detailed intentions for the use of proceeds were not disclosed.